After offering ultra-low cost data and free voice plans, Reliance Jio is planning to launch 4G-enabled VoLTE feature phones at Rs. 1500, according to a Twitter user Rajath Kumar K. R. (@rajathkumarkr). The tipster has leaked an image of Jio feature phone on social media platforms. 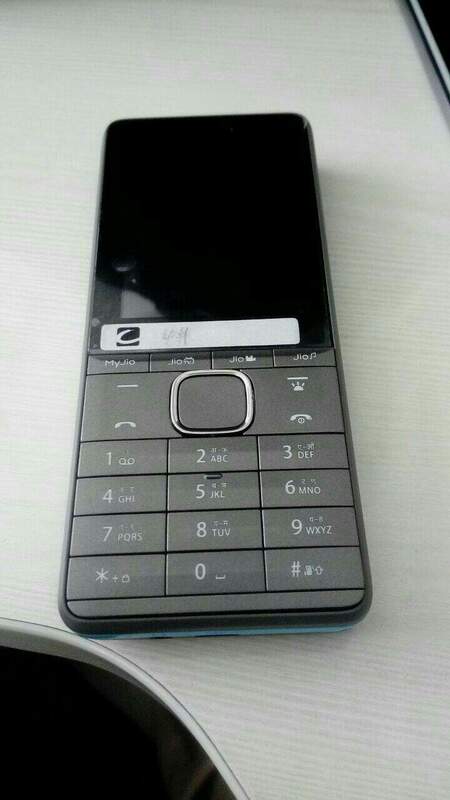 The image leaked shows a normal candy bar mobile phone with a display and keypad. There are dedicated keys allotted for JioTV, MyJio, Jio Music, and Jio Cinema. A few other reports surfacing online claim that the new Reliance Jio 4G-VoLTE feature phone would use Spreadtrum chipsets. The phone may also accommodate front and rear cameras. However, the leaked image does not confirm the presence of cameras. If the piece of information about Reliance Jio 4G-enabled VoLTE feature phone at Rs. 1500 is true, the Indian telecom industry may further undergo a round of disruption. Reliance Jio has already pocketed 72.4 million subscribers as of December 31, as per its recent report on Q3 (FY 2016-17) Financial and Operational Performance. The service provider crossed 50 million subscribers within 83 days of launch, which means it added six lakhs subscribers per day. Reliance Industries Chairman Mukesh Ambani already announced that its plans to grab 100 million subscribers in the shortest possible time. This target is not far to achieve if contrived with Rs. 1500 4G VolTE feature phones. If to recall, it already sold seven million LYF smartphones as well. The existing hurdle for Reliance Jio is its connectivity issues, which it blames on incumbent players like Bharti Airtel for not giving sufficient Points of interconnect (PoI). Once if this is resolved, Jio can penetrate further into the market.